The KNS 8400 -- with their ability to reveal exactly what you have on the tracks is an ideal choice for critical listening. Being able to discern the most subtle differences in pitch, timbre and tone helps you to get it right every mix, every take, every performance. Isolating memory foam in the ear cushions delivers improved low end response and because they gently conform to your unique head shape you'll be comfortable wearing them all day. KRK’s KNS8400s provide an accurate listening experience - taking you from commercial studio to personal listening to on-the-go track evaluations. Truthful reproduction and dependable voicing philosophy mean that top producers, studio musicians, performers and engineers have come to trust these headphones and allows for the accurate enjoyment of music. KNS8400 headphones offer exceptionally natural frequency response that delivers a reference standard unaffected by location. Day or night. Studio or home. Without disturbing others. Without compromising your tracks. The 8400s are built to be an honest reference monitor, empowering recording and mixing in the same manner of speakers, voiced to endure true to the character of KRK's class-leading studio monitors. Unbelievably accurate, the 8400s enjoy an extended low-frequency definition guaranteeing that the bass component of any track is accurately reproduced, as well as a natural, wide frequency response with a honeyed, eloquent high end. KRK’s KNS8400s offer reliable low-distortion accuracy and clarity as well as sturdy dynamic range. Users often discover that their favourite comfy, sturdy headphones bear little sonic resemblance to their trusted monitor speakers. Tradition has dictated that switching from speakers to headphones has represented a disconnect of sorts in the recording process. 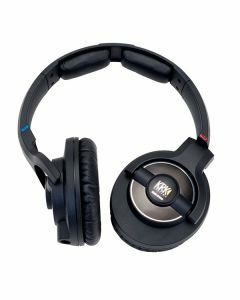 Drawing upon their decades of experience in studio sound, KRK has resolved this trauma with their KNS series headphones. These headphones also usher in a new standard of headphone comfort - even over extended periods of use. The 8400's circumaural design employs high-tech memory foam ear cushions, allowing them to conform to your ear to help ensure a comfortable fit during marathon sessions. KRK has thoughtfully spec'd these 'phones with replaceable parts, including a detachable high-durability oxygen-free copper cable with an in-line volume control. Delivering accuracy, comfort, and reliability, these puppies are designed from the ground up for pro monitoring so you can trust your headphones as never before. A new standard in headphone comfort, even over extended periods of use, designed to avoid feeling uncomfortable during long sessions. The memory foam conforms to the ear to help ensure an improved fit.